Our judge is playing the finalist games to determine a winner. Legacy games are board games that change over time based on the outcome of each game played and the choices made by the player(s). They will make physical changes to the board game by, for example: marking the cards, placing stickers, destroying components, opening sealed packages, and so on. The changes made in a Legacy game are designed to be permanent. A Legacy game's full experience is played out in a campaign that can only be played once. To replay the full experience again, the player(s) would need to purchase another copy of the game. Official and unofficial methods to circumvent Legacy mechanics are common in popular Legacy games. A Legacy game modified to avoid permanent changes is effectively a game with a campaign instead. Some great examples of legacy games are Risk Legacy, Gloomhaven, Charterstone and We Didn't Playtest This: Legacies. See also Board Game Geek's Legacy Board Game Family if these four don't get the creative ideas flowing. The contest will be judged by Chris Romansky of Sporktopia Games. Your game must use the legacy mechanism described above. You may use any printables or game pieces, but you may specifically want to take a look at embedded games and custom stickers. You may use any player count. The total cost of your game must be less than $99.99. Play time should be no more than 90 minutes, per session. Any theme or narrative is allowed and unique themes are encouraged. A rules document must be downloadable from your game's shop page, but you do not need to include any spoiler information. Base out of the box rules will suffice, so long as it's clear how the game is played. The game must be publish ready (as it relates to our shop, not as it relates to being finished). This means it has a logo, backdrop, shop ad, action shots, description, and cool factors. It must also have all images proofed, and have packaging. All entries must be submitted through TGC's game editor (by clicking on the "Contests" button) no later than Noon UTC (6am US Central) on February 4, 2019. $250 of shop credit on thegamecrafter.com. 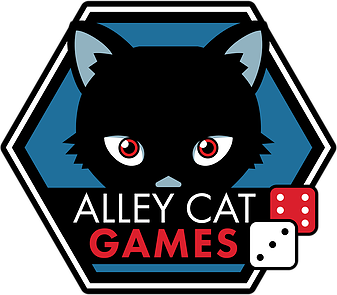 $100 of cash from Alley Cat Games. Automatic Showcase status for their game on thegamecrafter.com. *Consideration for publication will be discussed with the winner. It would be unfair to both designer and publisher to guarantee a contract through this contest but the winner will be strongly considered. It is possible other designers could be offered contracts as well. 5 Theme Is the theme unique and engaging? 10 Art/Graphic Design Does the art look good in the game? Are the components and shop page laid out intelligently and compelling? 20 Game Mechanics Is the legacy mechanism used in an interesting way? Does the game feel like a legacy game? Are permanent changes being made to the game? 20 Game Play How fun is the game? Is it compelling? Is the game worth playing again? 20 Rules Are the rules easy to follow? Do the rules hold up as content is changed and/or added? Are there examples showing key mechanics and setup? 10 End of a Legacy Is it clear when the legacy changes end? Is there a logical point where the legacy "story" concludes? 5 Intangibles This is a catch-all for any other items that make the game special.